Yes. It does look the way you say and you’re probably right – for now. The problem I (and others) see is that these people are all playing a huge and complicated, sometimes dangerous, game called politics. It’s all about getting elected (naturally). Trouble is, few of them can act half as good as they can talk and you and me are the losers – every time! PS, I hate WordPress ‘Snap’ – to me it’s simply annoying, which is why I disabled it. Oh, and I like the Hitchhiker’s Guide reference. While the economy has quickly become the key issue, I’m not sure it’s enough to completely downplay people’s fears about Obama’s lack of experience. Bravo, bravo. Excellent post. As we both know the horror of this week brought the American people’s focus and thoughts back on track of the issues. As Obama let’s to say, “now is the time” for him to take complete control and run with it. Good summary of the situation. The key tests are going to be the presidential debate. The first one is on the topic that favors McCain. I am expecting to see a gain for McCain there. Thanks for the comment — I always welcome. Thanks for the comment. Yeah — I guess that both candidates will do anything they can to be elected — as John McCain said — you run to win, and win to lead…We’ll just have to see who wins. As far as the snap — I kind of like it..but most of the time it really ticks me off. I think that obama has enough experience, but that’s just my play on politics. However, I do agree with you that the economy isn’t a big enough issue to overshadow the debate of Obama’s experience. Yes, the debates are really going to be big. The first one may be on a topic that favors McCain, but if Obama is successful, he will ultimately find some way to ride his momentum into the debate so he can overshadow that. yes, yes the focus there to be had…Obama, Raines, James Johnson, Dem’s stonewalling oversight in 2004 and on..to protect the largesse flowing down and to Obama’s (and Clinton’s) cronies. Good post man. I completely agree. It is time for Obama to run w/this. But there are a few things that are bugging me. As noted in other comments, I also do not believe Obama is using the financial crisis in the way you think. How you framed it implies that Obama is secretly cheerful at the thought of a financial meltdown. No, I don’t think Obama likes to dance on the top of the suffering of other people. Instead, what has happened is that the financial crisis gave Obama an opportunity to pivot the campaign back to the economy. It was only a matter of time before all these stories about lipstick and pigs would be drowned out by some real crisis, be it from abroad or on the domestic front. Both would have benefitted Obama because they would have given the traditional media an excuse to talk about something other than Palin or McCain’s post-convention bounce. At any rate, the crisis turned out to be economy-related, and that is in Obama’s wheelhouse, more than anything else. The situation on the ground dictates your campaign strategy. McCain’s campaign just seemed like it got caught blindsided by the financial meltdown, without any contingency plan to recover. Sound familiar? However, I think Obama has played this campaign out in his mind a few times and has plans for every contingency. He didn’t go crazy when Dems all over the country started demanding that he do something drastic last week as McCain’s bounce lasted longer than expected. He stayed at an even keel, which is pretty refreshing when you look over to the other side. In fact, in my opinion Obama is standing right in front of a locked pot of gold, with the key being in McCain’s hands. I’d like to think that McCain doesn’t have the key to this election. That implies that either McCain wins or he gives it up. No no no, I think Obama is fully capable of winning on his own, without too many hiccups from McCain. The gaffes help, but Obama had the complete strategy to win anyway. You may not have been intending this as your take, but that’s how it came across to me. At any rate, I think Obama wins this thing in an epic manner. He won’t be stumbling across the finish line. On election night, we’ll see how a masterfully run campaign translates into a masterful election day. I think we’ll be quite pleased. America, we are better than these last eight years. We are a better country than this. — Barack Obama, the next President of our United States. thanks for the comments and compliments — always welcome. In no way did I think that Obama was cheerful of the economic crisis in any way — I simply wrote this post to provide a different gist on a story that everyone else is writing about. That’s what I try to do here and a lot of times its mistaken. I totally agree with your second paragraph, it is only time not that the right’s cheap-shots get drowned away with news of something actually press-worthy. 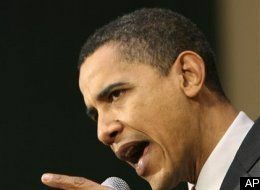 The economy is one of Obama’s big strengths, so I do think that he can come on top with this and that is why I wrote this post. I do think that McCain has the key to the election. I don’t think that McCain needs to LOSE for Obama to WIN, but at the same time the WAY Obama can win is through pointing out to the public that his opposition isn’t fit in any way to hold down the fort. And although I don’t think Obama will stumble over the finish line, it won’t be “epic.” I’m calling for a ten point lead with the effect of the debates. Right on the money! Could not agree with you more…hopefully Obama will continue the offensive move and strive to honestly point out McCain’s ‘reality’; while at the same time, Obama needs to keep clarifying his own positions and just how he is going to go about helping the American people. thanks for the compliments. I agree exactly with you — from a fan of Obama standpoint and from a strategic one. He proved to me (remember I can’t vote) that he is ready because of his stance and policies, and to get in to oval office he needs to tell the world about that. I think solving the Economy, Islamic Terrorism, and the Energy crisis, might be above the pay grade of a community organizer. In my opinion, that’s pretty out of line. If you want too look at it that way, I don’t think that leading the free world, fixing an economy crisis, finding clean energy, getting out of a war, and above all being the president is quite above the pay grade of a sports broadcaster. Great OP and great comeback. Thanx to pacer521 for linking to it. I agree. . .now is definitely the time for Barack Obama to put pressure on John McCain and take the offensive. . .but he has to do so without becoming offensive himself. Joe Biden has been swinging pretty hard at McCain ever since the conventions. . .but no one seems to have noticed that ( http://www.nytimes.com/2008/09/20/us/politics/20biden.html?ref=politics ), so it’s time to either bring Biden to the forefront, or take more advice from him on tactics. Yeah I think he has to do that and show McCain’s other flaws by answering the questions clearly and concisely durning the debates. He needs to make sure he focuses on the American people and say it literally that that is what he wants to do repeatly during the debate. I also think he has to show his skills in foreign policy during the first critical debate by downplaying McCain’s experience and showing McCain’s gaffes on foreign policy during the election while highlighting his skills. And not stutter so much and overthink his answers. Just be smooth with it. Sorry I couldn’t answer your comment — it got stuck in the askiment spam filter and i just found it. Thanks for the compliments and agreement! Obama, other than not being the incumbent party in the White House, has no compelling qualifications when it comes to the economy. Obama was a part of ACORN (Association of Community Organizations for Reform Now) that had filed suits against banks to make high risk loans to low credit customers. While I do not believe his work with ACORN has brought on the current meltdown, I believe the prevalent philosophy that Obama and others in Congress share have significantly contributed to this problem. In an effort to significantly expand home ownership through Fannie Mae and Freddie Mac, politicians have laid the foundation for the current crisis. Obama, during his short time in the Senate received five times as much political contributions from Fannie Mae than McCain. What is really scary is that he has Franklin Raines, a former executive at Fannie Mae, is on his staff. That is a scary combination.